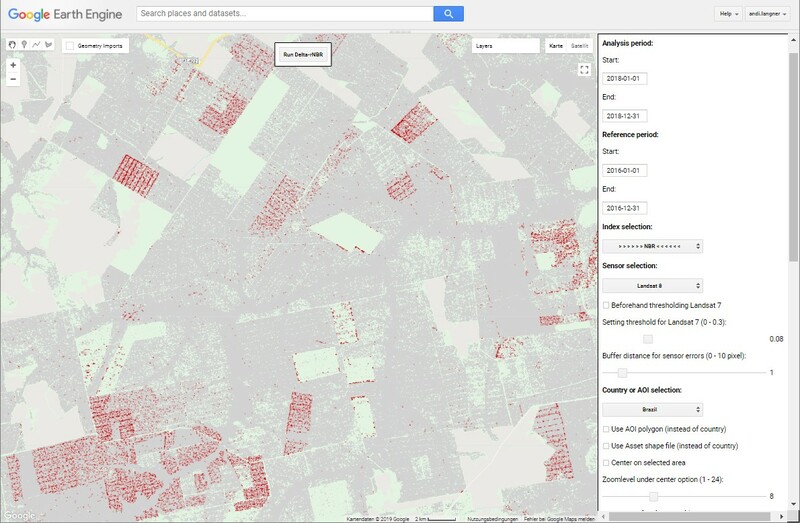 The FCDM tool supports the detection of forest canopy disturbance from satellite remote sensing and can provide indication on forest degradation processes. Reporting on forest degradation is required by many tropical countries participating in the REDD+ (Reducing Emissions from Deforestation and Degradation) program. However, compared to deforestation, the mapping of ‘forest degradation’ has proven to be technically much more challenging and the signal of a forest canopy disturbance is less prominent, as it does not result in a change of land cover. The FCDM tool developed at the JRC uses a change detection approach based on the difference (delta) of the self-referenced ‘Normalized Burn Ratio’ index (Delta-rNBR; Langner et al. 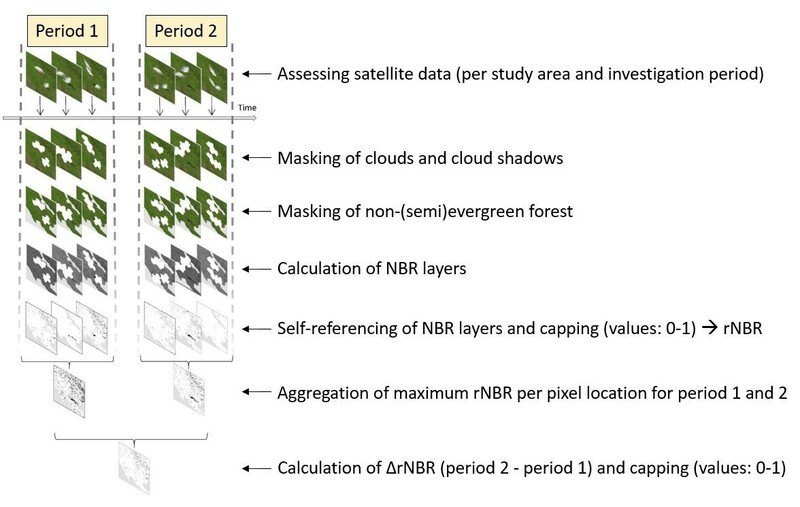 2018), detecting forest canopy change over defined periods at pixel and sub-pixel level (Figure 1). The underlying Delta-rNBR index allows the detection of forest canopy disturbance within tropical evergreen forest canopies (‘forest remaining forest’), resulting for instance from the tree removal, felling damages or from logging trails and leading. The freely available FCDM tool runs under Google Earth Engine (GEE) and allows the user via a specific GEE user-interface to calculate the Delta-rNBR index over any desired area by choosing the main parameters from simple drop-down menus, without the need of knowledge in scripting. User-interface of the FCDM tool in Google Earth Engine. The grey color within the map displays the forest mask within which canopy disturbances are mapped (red color). Forest canopy disturbance can be detected at much higher consistency and reliability levels when using whole periods within the FCDM tool instead of single dates, e.g. including all image acquisitions available in the Landsat or Sentinel-2 archive for whole seasons or whole years, and capturing canopy disturbances even if occurring only occasionally. The main processing steps applied within the FCDM tool are shown in Figure 2. Processing steps of the FCDM tool.